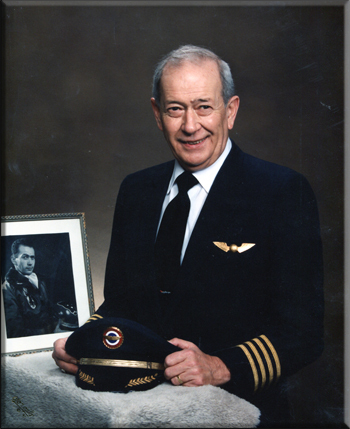 RNPA has sent word of the passing of USAF veteran and retired NWA pilot Captain F. P. ‘Pat’ Kearney, age 80. Captain Kearney hired on with Northwest 01-09-1967 and retired at the mandatory age 60 as a 747 Captain. Please join the family in celebrating Captain Kearney’s life at the home of son Shawn and Heidi Kearney at 2 PM on Saturday, April 20, 2013. For directions call 206-755-4040. Francis Patrick Kearney, of Bellevue, Washington, died peacefully at home on Monday, April 15, 2013. He was 80 years of age. Pat was born on January 23, 1933 in Minneapolis, Minnesota, son of Francis (Frank) and Frances (Fran) Kearney. He and his younger sisters, Bunny and Kay, were raised in the Minneapolis suburb of St. Louis Park. Pat attended St. Louis Park High before he enlisted in the United States Air Force where he got his wings as a jet fighter pilot flying the F-86 Sabre. While stationed in Chaumont, France, he met his beautiful, loving French wife, Colette, who worked on the base as a telephone operator. They married nearly 57 years ago on August 4, 1956 in Chaumont’s Basilica. Pat and Colette moved to the United States where he was discharged from the Air Force as a Lieutenant in October 1956 and started their family in Sacramento, CA where Tim and Michele were born soon after. In 1961, the family moved to Bellevue, WA shortly after visiting the great northwest and extended the family with the additions of sons Shawn and Kevin. He and Colette fell in love with the area’s beautiful mountains, lakes and trees and called Bellevue home for over 50 years. Pat was a generous and loving man and cared for his entire family which also included his niece and nephew, Pascale and Daniel who lived with Pat and Colette’s family after moving to the States from France soon after their father passed away. After a number of years working at Boeing he decided to apply his flying skills to the commercial airline business. He was hired in 1967 by Northwest Airlines and after over 25 years he retired as a 747 Captain. Pat had a passion for building projects after having enjoyed creating the downstairs living space in his home. He had an incredible memory and you definitely wanted him on your Trivial Pursuit team. He enjoyed puzzles of every kind, particularly crossword and jigsaw. He had fun playing golf and Bridge. He especially loved being with his grandchildren including Eliot and Theo, sons of Daniel and Pascale Queva, who were also very dear to his heart. He enjoyed watching sports, mainly golf, with his family and was an aficionado of old movies. He loved telling stories about his flying days and often broke into song with his favorites from years gone by. Pat was a wonderful husband, father, grandparent and friend. He cared for and touched everyone he ever met and loved. He will always be in our hearts and will be missed by all. He was an amazing influence on all who knew him and his legacy as a loving and caring man will live forever. Pat leaves behind many loved ones and is survived by his wife Colette, daughter Michele, sons Tim, Shawn and Kevin and his 5 grandchildren , Christine, Chelsea, Nathan, Patrick and Natalie, sister Frances (Bunny) Long, Kearney descendants and the Queva extended family. Please join the family to celebrate Pat’s life at the home of Shawn and Heidi Kearney, 2pm, Saturday, April 20, 2013. For directions call 206-755-4040.